Alterna Hemp Texturizing Catalyst is infused with ultra-hydrating hemp seed oil. 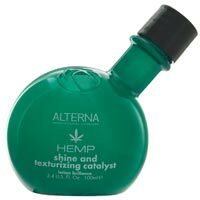 Alterna's Hemp Styling products protect and strengthen hair while addressing an array of styling needs. Shine and Texturizing Catalyst smoothes and conditions the hair cuticle for weightless, brilliant shine. Just a small amount before blow-drying increases manageability, eliminates static and maintains volume, leaving hair soft and shiny. Benefits: Acts as a thermal protectant. Provides weightless humidity resistance. Smoothes cuticle while adding intense shine. Assists in detangling the hair. Directions For Use: Use a quarter-sized amount on damp hair for a smooth, controlled blow out. Try some today or give to a loved anytime of the year!